With apologies to all my regular readers, Theatre Room has been on an extended summer break. During that time I have been storing up a host of the all things theatre to share and I’m going to start with an article published last week in UK’s The Stage. Written by Lee Anderson, How dramaturgy is finding its place in British theatre explores the growing role of the dramaturg in the UK. As I have written here before, dramaturgy is a difficult beast to define, not least because it takes many forms. As Anderson quite rightly explains, in the UK, the adoption of the role of the dramaturg has been sluggish, simply because the playwright dominates. The article itself gives a good definition of the role and purpose of the dramaturg in the theatre making process. Dramaturgy is a tough nut to crack. Despite occupying a vital role in countries such as Germany and across continental Europe, we in the UK have struggled to pin down a precise definition for the dramaturg. Because of the playwright’s pre-eminent position within our own theatre culture, the tendency has been to conflate the dramaturg with the literary manager. 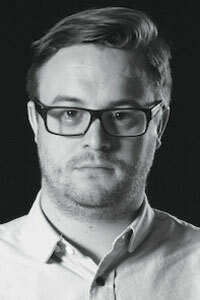 Meanwhile, the dramaturg of German theatre tradition has long fulfilled the role as a creative curator; collaborating closely with a director or specific theatre to conceptualise a season of work. But with a new generation of theatremakers now inspired by practices from abroad, these artists are now shaking things up on British stages. Influenced by new models of working and reinvigorated by bold aesthetic choices, directors and playwrights in the UK are challenging traditional ways of working and adopting a fresh, internationalist approach to their work. As the landscape begins to shift, so too is our understanding of the dramaturg’s role within it. One of the reasons the dramaturg has remained difficult to define is to do with the fluidity of the term itself. There are no hard and fast rules for mapping the precise function of dramaturgy. As a practice, its principles are based on adaptability and versatility. Duska Radosavljevic, lecturer in European and British theatre studies at Kent University, and author of Theatre Making: Interplay Between Text and Performance in the 21st Century, considers the dramaturg’s role to be above all else a relational one; not anchored to any specific criteria, but responsive to the demands of the process. “The dramaturg’s job is often determined by the kind of relationship they have with any given collaborator,” she explains, “so in terms of methodology or models of working, they don’t always apply in the same way from one process to the next.” In other words, it is far from being an exact science. In the absence of an all-encompassing definition, it is easy to see how the dramaturg has remained such a puzzling concept for many. Traditionally, the dramaturg’s role in our own theatre culture has been inextricably connected with the development of new writing. Unlike the Regietheatre tradition of modern German theatre, in which an emphasis on reconceptualising classic texts has resulted in a director-based dramaturgy, the British theatre dramaturg has focused ostensibly on artist – namely, playwright – development. It is a model that prioritises critical development above creative intervention. Nevertheless, even within a culture that locates the playwright at the centre of its activity, the influence of theatre practices from abroad have continued to influence artists and playwrights: “We’re finding that more and more playwrights in this country are increasingly exposed to theatre from around the world,” says Drummer. “They’re exposed to new and interesting ways of telling stories. We want to harness that and experiment with how we can push our theatre, our artists and our audiences.” This commitment to expanding the boundaries of what is theatrically possible has resulted in a programme as diverse as it is eclectic. Recent works such as Caroline Horton’s bouffon-inspired Islands and American playwright Marco Ramirez’s The Royale testify to the dramaturg’s role as an advocate – supporting the work of artists and curating a season of work. Despite a range of approaches, the dramaturg remains something of an unsung hero. In Radosavljevic’s words, the dramaturg occupies an “invisible role”, operating beneath the radar of the creative process they are serving. And yet the dramaturg’s liminal status remains his or her greatest asset, whether as conceptual curator, creative pathfinder or critical provocateur. I believe actors of all colour, particularly black actors, should be cast for the immensity of their talents and not the slack-jawed nod to political correctness. To reserve, out of the hundreds of Shakespearian characters, the role of Othello for black people only, is a form of racism in reverse and to me, particularly obnoxious. What drama does is express the fundamental core of human existence and to omit one play, is like taking a major key out of a piano. 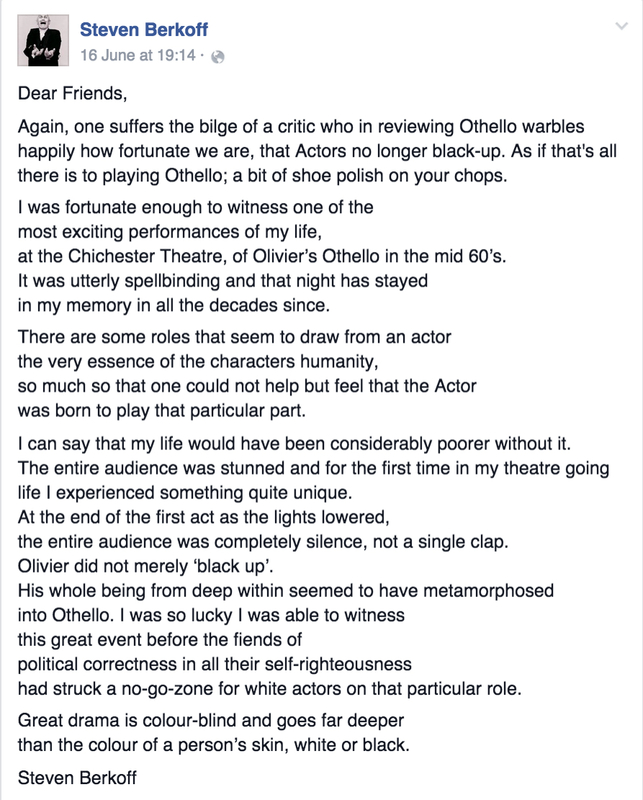 The immense range and passion of a role like Othello belongs to all humanity. In its performance, it reveals the deepest part of the human soul. Some of the greatest performances seen over centuries have been when an actor has taken on that particular part from Edmund Kean onwards. I would like to see black actors not only play Othello, but Macbeth, Lear, Hamlet etc. 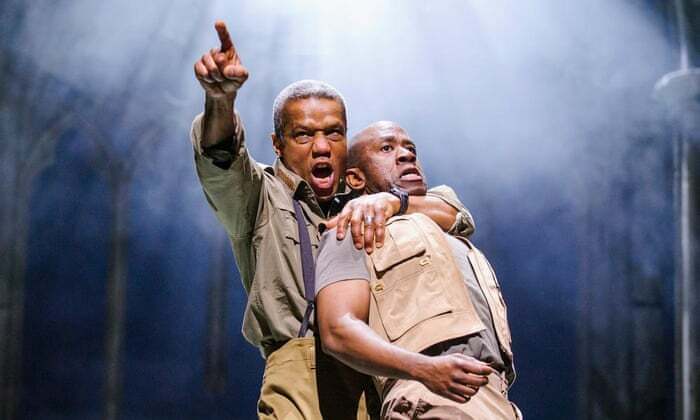 The production in question has been universally celebrated by the critics largely for the casting of Hugh Quarshie as Othello and Lucian Msamati as Iago (above). In his review Michael Billington comments that amongst other things the casting reinforces the historic bond between Othello and Iago, and helps to explain the trust the former places in his ensign allowing you to see exactly why Iago would detest a Caucasian Cassio who tries to show his kinship with the men by taking part in a rap contest during the Cypriot drinking scene. Dominic Cavendish, writing for The Telegraph talks about a crucial shift of perspective…..that makes this event…electrifying and that a blow is struck for diversity without at all diluting the play’s perturbing power. These are strong affirmative words. It is appalling that black actors don’t get cast in what are seen as white roles – Hamlet, Lear, Stanley in The Birthday Party. A travesty that so many of our non-white colleagues find they have to go to the US to kick start great careers. Perhaps when we colour blind cast black actors in ‘white’ roles, we can think again of white actors in black roles but until then black actors are right to argue that Othello is theirs. I tend to agree. However, for me as an international theatre educator based in South East Asia who needs to teach through the context of world theatre, the question of colour-blind casting is an ethical dilemma. I would love to direct my students in, say, A Raisin in the Sun, Sizwe Banzie is Dead, The Island or a whole host of plays that have indigenous Australians or native Maoris as central lead characters, but I just don’t feel that I can. Does that make a fiend of political correctness? Three articles published over the course of the last week, by The Guardian UK, have caught my attention. The first, a review by veteran theatre critic Michael Billington, about a ‘play’ called 2071. I use the inverted commas advisedly at this point, as the piece has one actor, a scientist called Chris Rapley, who spends 70 minutes talking to the audience about climate change. Some might, and indeed have, called it a lecture, nothing more. Some will argue this is not really theatre. But the idea that theatre should be exclusively reserved for fiction has been knocked on the head by a surge of documentary dramas and verbatim plays. And Katie Mitchell, who directed both this show and Ten Billion, realises that the eye needs to be satisfied as well as the ear. Rapley sits in a chair and, without notes, talks to the audience with an astonishing calm and command of facts for 75 minutes. Meanwhile Chloe Lamford’s design presents us with swirling video images behind him that illustrate Rapley’s arguments and have a strange beauty of their own. The play is being staged at The Royal Court in London under the directorship of Katie Mitchell, who did a similar staging two years ago with a piece entitled Ten Billion where scientist Stephen Emmott (below) spoke about global over-population and its consequences. In fact Ten Billion was given the number 10 spot in the best plays of the year, according to one newspaper. In this podcast from the Royal Court Duncan Macmillan (co-writer), Mitchell (director) and Rapley (speaking as scientist, co-writer and performer) talk to literary manager Christopher Campbell about the play. The subject matter is undoubtedly emotive, but more so political and therefore ripe for the theatre – even if it is a difficult subject to stage. I am sure that it is no coincidence that on the same day Billington’s review for 2017 was published, he also wrote a rallying piece entitled Speaking truth to power: this is the rebirth of political theatre in which he talks about the resurgence of political theatre on the British stage at the moment, 2017 included. You can read the article yourself, but I’ll finish this post with his final paragraph which says much about the theatre I was brought up with, educated by and in which I believe passionately. A gnarly little piece today I came across in The Independent, Why are theatre directors messing with the classics? Written by journalist Adrain Hamilton, he bemoans (British) theatre directors who play with the text and/or original intent of the playwright. Has it ever been thus. Now far be it from me to suggest that Mr Hamilton (who is not a theatre critic or in any way connected professionally with the theatre) is simply whining because he may have witnessed a production of one of his favourite classic plays that he didn’t like (although I suspect there might be something in this). It’s not that I disagree with him totally. Indeed he makes some decent observations, but theatre is an interpretive art form, especially when dealing with the more classic/historical texts. There has to be a relevancy for a contemporary audience and it the director’s job to make that so. Of course it doesn’t always work, but that is theatre for you. 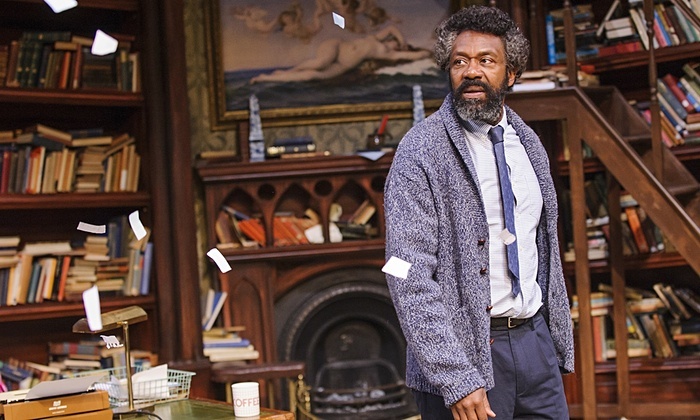 Why are theatre directors messing with the classics? There are no more dreaded words in the English theatre today than “in a version by”. Whether it’s Ibsen’s Ghosts, Euripides’ Medea or Sophocles’ Electra, nothing will do but that the international giants of the stage be taken by an English writer and refashioned for the English audience in their own words.No one should doubt the theatricality of these “versions”. Greek tragedians, as indeed Ibsen, created great parts for female actors and this is what the British directors have seized on with such fervour today. Kristin Scott Thomas as Electra, Helen McCrory as Medea and Lesley Manville as Ibsen’s Mrs Alving have all been successively hailed as the new divas of drama for their anguished performances of tortured, wracked women. Just as we perform Chekhov as the supreme English ironist, rather than the caustic writer of near farces, which is the way the Russians do, so our directors and dramatists rework the classics as studies in angst and high emotion, women on the edge not just of a nervous breakdown but of infanticidal self-destruction. Only that is not what these dramas are actually about, or not as their authors intended. 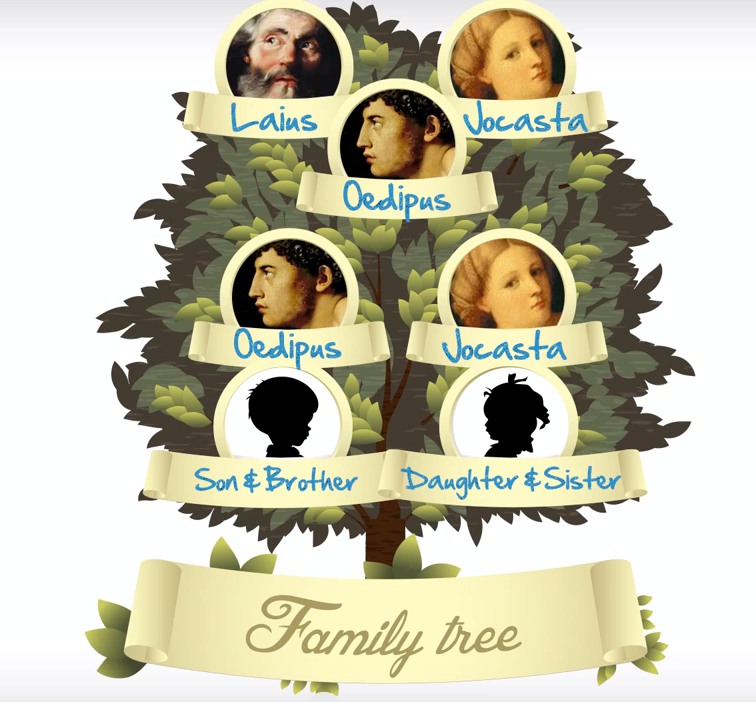 The great classical dramatists didn’t set out to present psychiatric studies of individuals and their torments. They wrote about the human condition through the dilemmas and fates of individuals. The same goes for Henrik Ibsen. A would-be poet himself, he wanted to express what he saw as the societal truth of his times. Sir Richard Eyre’s reworking of Ghosts, and his earlier Hedda Gabler, at the Almeida, are finely crafted works of domestic drama in which events speed their way to a horrifying conclusion, impelled by revelations which strip their heroines of all illusion. 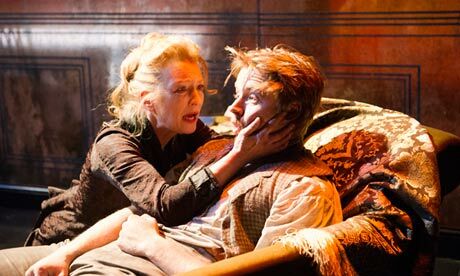 It’s Chekhov on speed, even to the point of climaxing the play with Mrs Alving administering the medicines with which to aid her son’s death. But Ibsen didn’t write that. He left his heroine gripped by indecision whether to carry out her son’s desire to die or to refuse such an unnatural maternal act. Sir Richard’s version makes for a more melodramatic finish; Ibsen’s for a more troubling one. Which is how he saw his play, a very carefully modulated study through the dialogue of human evasion of how we are all made by our past and convention. If you want to see the difference between the way that the British domesticate drama and other countries seize on the ideas behind a play, then the Barbican’s current series of international productions of Ibsen should be a revelation. The Berlin Schaubühne ensemble’s An Enemy of the People, the play he wrote in anger at the way Ghosts had been dismissed by the critics, is an interpretation full of the urgency that this angry assault on bourgeois conformity requires. Switching the time to now, it has all of Ibsen’s weight and weariness with the society about him but also his sense of the human part within it. 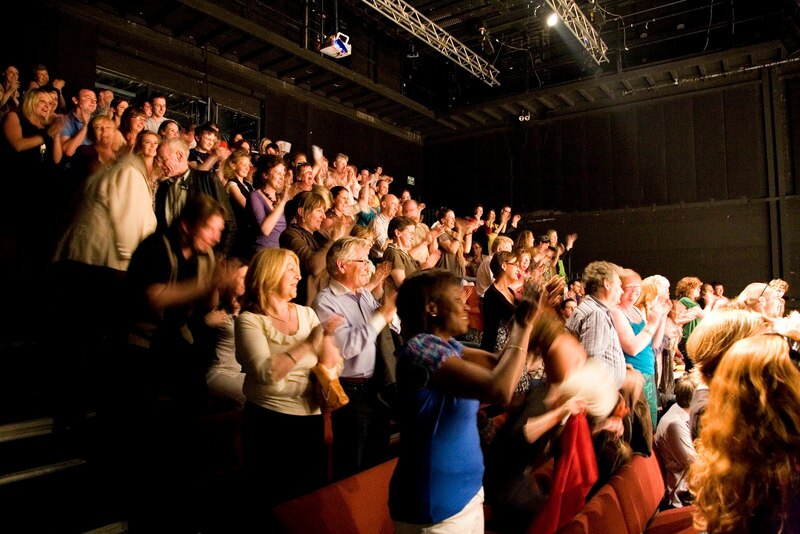 If the production stuttered in London it was in trying, in the middle, to involve the audience in the debate. It apparently worked in performances elsewhere but not here. The English don’t go in for direct confrontation, let alone over ideas. It gets worse with Greek tragedy. With a deeply affecting central performance, the National’s Medea wrung every emotion out of the story of an abandoned woman who wreaks revenge by killing her own children and dragging their bodies into exile in an end reminiscent of Bertolt Brecht. Only Euripides is not Brecht and he didn’t write Medea as a story of a wronged woman wrestling with her conflicting emotions. The Medea of Greek legend is a witch woman of terrifying force. The tragedy is one of anger and vengeance which cannot be constrained. At the end you feel not pity but horror and fear. You don’t have to do Greek tragedy on a bare stage and skimped costumes. The poet Caroline Bird’s version of Euripides’ Trojan Women at the Gate Theatre in 2012 was one of the most intense theatrical experiences I’ve ever had. Moving the scene to a maternity hospital, it worked because it remained true to Euripides’ vision of captured women, turning in on themselves as they await their fate. But you can’t do what Frank McGuinness, whose adaptation of Electra is now playing at the Old Vic, did in the opera of the Theban Plays and mess around with the order at will. At least you can’t do it and still leave Sophocles on the credits. Yukio Ninagawa, arguably the greatest theatre director of our times, who directed an electrifying Medea in Japanese, will only work with line-by-line translation. Presenting Shakespeare’s Cymbeline recently the Barbican (he’s back there with Hamlet next year), he apologised for changing a word in making a cedar into a pine for visual reasons. If only British directors would pay foreign dramatists the same respect when they turn them into English. I went in search of the reviews of some of the plays that Hamilton vilifies as domestic. The same paper that carried his article, The Independent, gave the production of Euripides’ Medea he mentions 4 stars, calling it unforgettable and horribly gripping, as did The Telegraph who said it was thrilling and merciless. Richard Eyre’s production of Ibsen’s Ghosts, meanwhile was given 5 stars in The Independent – A spellbinding production – as it was in The Telegraph, with the final line of the review observing that Theatre seldom, if ever, comes greater than this. Finally, the production of Sophocles’ Electra was again given 5 stars by The Independent, calling it an evening of unalloyed magnificence; The Telegraph said it was Theatre at its best with The Guardian undermining Hamilton’s whole premise in the final paragraph of its 4 star review. Immersive theatre: living up to its name, or just an overused gimmick? My, there is an awful lot of immersive theatre around at the moment, particularly if you live within reach of London. You can watch Titus Andronicus performed in a car park in Peckham, visit Dorian Gray’s townhouse in Greenwich, pretend you are a spy in CoLab’s London-wide, digitally-augmented Fifth Column or – if you’ve £200 to spare – spend the night in a London hotel and watch the immersive play Backstage Tour. Some of these shows deserve the tag. But I’m beginning to think that immersive has become one of the most overused terms in British theatre, in similar vein to that other much misused term, site-specific (or site-responsive), which is likewise often bandied about with little or no justification. Standing around watching a show in a room that appears to have been designed by an Oxford Street store window dresser doesn’t magically make the audience experience something immersive, no matter how many stuffed animals you incorporate into the set. It you want an enjoyably sly swipe at the immersive phenomenon, take a look on the excellent Exeunt site, where Natasha Tripney has cleverly reframed her East Coast trains journey back from the fringe as immersive theatre. The rise of immersive theatre undoubtedly reflects an interest from audiences – often audiences who may not think that traditional drama in traditional theatre playhouses is for them – in experiencing theatre in a different way, one that allows them to be part of the story and feel as if they have dropped down a rabbit hole into another world like Alice. In some instances where the audience can genuinely roam where they want, the experience is more akin to gaming than traditional theatre. Some companies – Coney, Lundahl and Seitl, Punchdrunk, Ontroerend Goed and Look Left Look Right among them – have perfected the art, finding ways that make sense of why the audience is present at all and allowing them to play their part. Such companies don’t mistake mere intimacy (lovely though it can be) for immersion, and in some instances give us genuine agency. But I keep on seeing shows that claim to be immersive, and turn out to be anything but. Performing a show in a car park (Titus) while Southern trains constantly thunder by, so that Rome appears to be situated at a railway junction, or making audiences run away from zombies in an underground space in Edinburgh (Generation of Z on the Fringe), doesn’t make it immersive, it just makes it a show in an unusual – and not necessarily suitable – location. That’s fine. But short-changed audiences will quickly learn that immersive shows often don’t deliver on what they promise, and they will stay away. Strong and portentous words from the venerable Gardner, and she is rarely wrong, in my opinion. Her reference to The East Coast Trains Show written by a fellow critic Natasha Tripney, and published in Exeunt is definitely worth a read (and a wry smile). Beautifully tongue-in-cheek, but harbouring similar grievances expressed by Gardner and a sense that she too has experienced one too many pieces of immersive theatre that simply are not. Thug Notes is a deliciously executed example of a trend that has been around for years: the application of street sensibility to high-culture, high-concept areas and, more generally, any place where it’s not expected. The Independent in the UK has a great interview with Sparky. To date there are 300,000 subscribers to the the Thug Notes Youtube channel and 850,000 hits on his ‘drop’ on To Kill a Mockingbird alone. As of today, I’m a subscriber too. One of the pleasures of London theatre-going over the past 20 years has been just how many foreign-language productions it has been possible to see. Shakespeare performed in another tongue has been a particular revelation as the Globe’s 2012 Globe to Globe season amply demonstrated, although what made that – and it’s ongoing spin-offs – so pleasurable was the chance to see Shakespeare amid an audience whose native tongue was the language in which the play was being performed. If you want evidence that London is truly an international city, this is it. But there have been plenty of other opportunities to see oh-so-familiar classic plays in other languages, particularly at the Barbican, where Thomas Ostermeier has made us rethink Hedda and A Doll’s House and Hamlet, and will shortly be pitching up with An Enemy of the People. The London international festival of theatre has also done more than its bit to bring the world to London. In many of these cases it is the arrival of surtitles that have really made foreign-language productions accessible to those of us who do not speak or understand enough to get by. Without them I suspect many such shows wouldn’t get an English-speaking audience. I remember a time when if you went to see a play in another language the best you could hope for was headphones and intrusive simultaneous translation or a free sheet detailing the action in each scene. Good surtitles are a real art. One issue with surtitles is positioning. Poorly sited surtitles are like trying to hold a conversation in a room where a TV is on. However much you try not to look at them, your eye is constantly drawn towards them, even if you speak the language. You end up relying on the text rather than looking for other clues, which in a great production of a play in any language are demonstrated in a myriad of ways from the positioning and space between the characters to the timbre and tone of what is being said. It’s possible to understand a great deal about a production from its look and sound, even if you don’t speak a word of the language in which it’s being performed. Too much reliance on surtitles turns audiences into dummies, a bit like those tourists you see at Stratford who follow the entire production with their nose buried in the text on their lap as if it’s only the text that matters and looking at the stage is not necessary. Poor surtitles can be a hindrance rather than a help, as I found at the Globe last week with a Spanish-language production of Punishment Without Revenge. In this instance they were simply describing the action and not particularly well: it’s enormously frustrating and sometimes bewildering to be told that someone is speaking in metaphor or telling a joke and not to be told what the joke is. I reckon that in this instance no surtitles – and a simple synopsis sheet – would be far better than surtitles that distract the eye from what is happening on stage and are way too blunt to add any value to the viewer. What do you think? And if you’ve ever seen any real surtitle howlers do share. I have considerable sympathy with Gardner. I have, on occasion, found myself at the front of the stalls, unable to read the surtitles (which are almost directly above me) and watch the stage action without needing a visit to the physio the following morning. In some of our smaller and older theatres the surtitles are shown to the side of the proscenium and you end up looking like a spectator at a tennis match. I’ve also experienced the earphone and recorded translation version elsewhere in Asia when watching theatre – once I had to leave a Bunraku performance in Osaka after about an hour because of my ever-growing irritation with the mono-tonal drawl of the voice in my (one) ear. The comments section that follows Gardner’s blog continues the debate as does this post from BTI Studios, which talks about the difficulties of ‘captioning’ in the theatre. 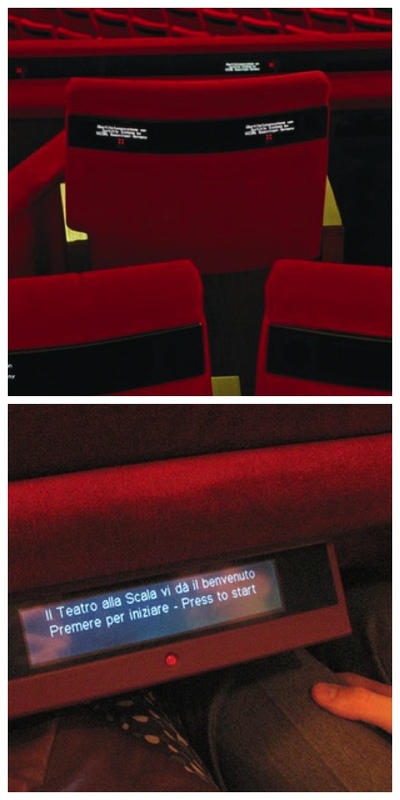 One theatre in Germany, the Komische Oper in Berlin, has the surtitles shown on the back of seat in front of you, as does La Scala in Milan (both opera venues you’ll notice). This is clearly a move in the right direction in terms of being able to view surtitles clearly, but of course, does nothing to address the translation issues or how they are used by a venue (as in the example given by Gardener at The Globe Theatre). It seems that any large city with cultural aspirations now stages an international theatre festival, so watching performance in a language other than your own is no longer an unusual or unique experience. Given this, I think it’s about time venues in particular, but theatre makers more widely, become a little more adept at making captioning work for the audience, both technically and artistically. By way of a post script, and not unconnected, the Royal Shakespeare Company in the UK have just announced that they are going to translate all of Shakespeare’s plays into Mandarin, as well as translating 14 seminal Chinese plays into English (although these have yet to be named). Quieting the cynic in me and over-looking the PR puffery about boosting business and cultural links between Britain and China, this could mean some exciting Chinese work being available in translation for the first time.